The internet business is reserving a special position in the industry rapidly as a result of the extreme convenience and easiness it offers to the customers. Over time, it continues to revise the style, scenario and infrastructure of business domain. By the way, using a mobile app is a great way for managing and marketing the furniture store as it is quite easy to do so. So while you are the owner of a furniture store then this application is a great boon for you. In fact, with the help of the app, you have the convenience to expand your business very well. To be precise, you can sell your products online and turn around your business sales more than ever before! Interestingly, the app comes rendered with a variety of prodigious features, which can achieve your business needs and goals. Also, the features will appeal to the users to a nicety. So while you are impatient to get the app, you must be looking for a reputable mobile app development company that can develop application in accordance with your preferences and needs. Well, there is nothing to worry about now. Just feel happy, as BroadNet Technologies has the great answer for you. We are the right and well-thought-of mobile app developers that you are looking for. Our Mobile Application Development Experts have a great mastery of developing the mobile applications of all types to deliver you compatible, dependable, fast, and usable application that is also in sync with your needs. We will develop the application so staggeringly well that you will be pleased about using it. If you own and deal with multiple furniture stores in physical locations then the customers hailing principally from a specific location can get access to your products. Also, if you are in planning to commence an online business store, it will attract more number of targeted customers to your business, only to leverage your business visibility and turn around its sales. If your products have the thing to satisfy customers easily, the business will soon be at the leading edge via the app. So what is the wait for? 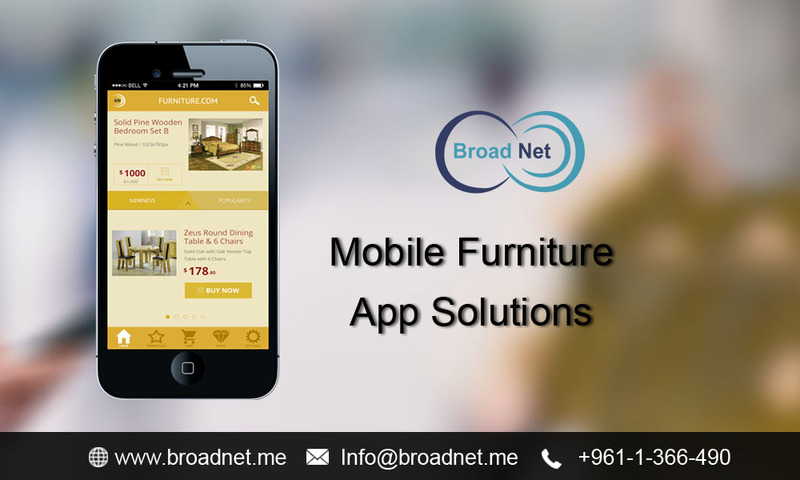 Contact us at BroadNet Technologies and let us know about your preferences and needs and we will deliver you the best Furniture Mobile App Solution without costing you a fortune.